NOTE: You must first remove the rear cover on model 645-424 to install the batteries and set the time. 1. 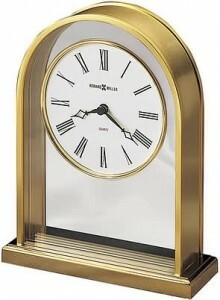 Turn the time setting wheel on the back of the clock, to set the hands are reading 6:45. 2. NOW INSTALL THE 3 “AA” size batteries in the battery holders on the back of the clock. Make sure the (+)and (-) symbols on the batteries match those in the holders. 3. With the time setting wheel on the back, set the time with the hands moveing CLOCKWISE until you reach the correct time. Remember you are starting from 6:45 AM. The clock has an automatic night time silencing feature. If set properly, the clock will not chime during the night time hours. If no melody is played when you press the set button, the clock is in night time silence mode. Continue to press the button until the correct melody is played. if the melody does not play during the day time hours, but does play during the night time hours, press the set button 12 times to adjust the melody settings from a.m. to p.m. If the instructions below are followed carefully, no additional adjustment of the melody should be needed. If for some reason the clock does not play the correct melody each hour, use the set button to adjust the melody as described below. 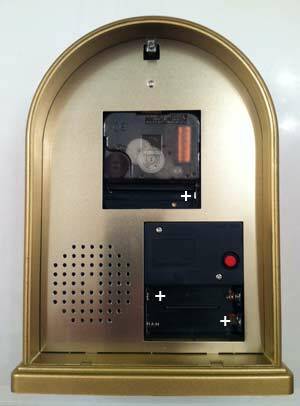 Press the red set button on the back of the clock and listen to the melody played. Each time the button is pressed, the clock advance’s to the next melody. Using the information below, press the button until the melody played matches the current hour. 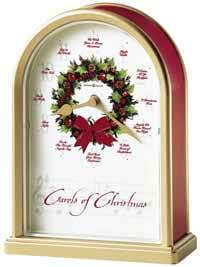 Example: If the current time is 10:20 a.m., press the button until the clock plays The First Noel. When the clock stops or the melodies start to sound abnormal, it is usually the sign of weak or exhausted batteries. After replacing the batteries, follow the instructions above to reset the time and melody. Just a note to say I received my order yesterday, and I’m happy to add that the whole shopping experience with The Clock Depot, from ordering, through my customer service experience, to delivery and quality of merchandise has exceeded my expectations.